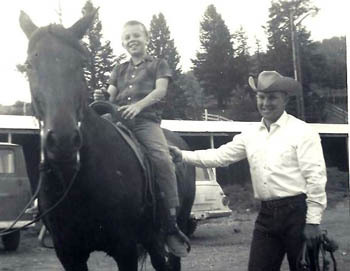 Until he was ten years old, Alan Forseth lived an idyllic urban life. His home, just off Kingsway, wasn’t too far from Nat Bailey Stadium and Queen Elizabeth Park. His schools, Tecumseh Annex B, and Lord Selkirk, were located in interesting neighbourhoods. Nearby were a movie theatre, a store with well over a dozen slot-cart race tracks track and arcade games. “If you had to go to school”, Alan remembers, “these were the schools to go to. There was also a Five and Dime store where a kid could buy a lot of garbage, er, treasures.” Across the street from Lord Selkirk Elementary were a corner store, ‘with real penny candy’, and a tannery which sold little pieces of rabbit fur. A kid could have his own stock of ‘wild’ animal skins. The commercial bakery which sold day old doughnuts two for five cents completed a child’s idea of perfection. 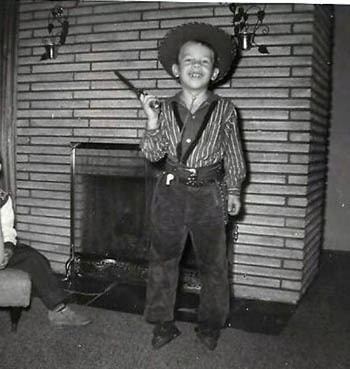 He could have his sugar fix, race, and collect real animal skins, all while obediently going to school. Weekend excursions downtown were for shopping in the variety offered by the Army & Navy Store or Woodward’s. Woodward’s occupied a whole city block. At Christmas people went just to admire the mechanized displays in the store windows. They packed up the house, loaded up the kids and moved. “One of the first things we realized was that we could go anywhere we wanted and roam the whole valley. We lived in the ‘old airport’ subdivision. There were woods on both sides and an old wooden tunnel where we played war games. We could take our bikes to the park and be gone all day, no one worried. 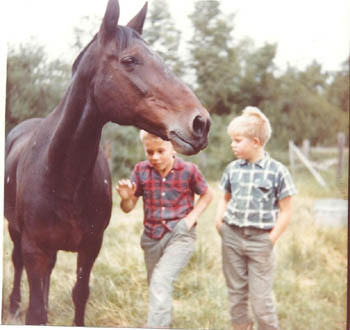 One of the first things the family did in Williams Lake was acquire a horse. Her name was Queenie and she was twenty-three years old when they bought her. Queenie was boarded at he Stampede grounds. They could ride her behind the barns there or ride her out in the valley. Owning a horse offered new opportunities. Alan hooked the straps of two mail bags over the saddle horn and used Queenie to deliver the Vancouver Sun. The system worked well, but it didn’t last. Subscribers didn’t appreciate hoof prints on their lawns. So much for the Williams Lake Pony Express. It was that small town feeling that helped Alan get his first job in radio, as a janitor in the Williams Lake station CKWL. Bob Leckie, station manager and part owner, gave him a chance. Alan worked his way up from janitor to turning on the church services Sunday morning, to a one hour air shift. When, eventually, he became a regular announcer who also did selling and production, he was familiar with the Cariboo. It helped that he’d been playing in a country band. “We played all the little places; Clinton, Big Lake, Likely, Anaham, Riske Creek, Alexis Creek. We played on various stages in all the community halls. Most places don’t have them anymore.” When Alan did the Message Broadcast from CKWL, he’d been to almost all the places mentioned. He knew that, to people in the Chilcotin, Williams Lake was a big city. It was a day trip to go from Black Creek to town.